Born in Kobe, Japan in 1923 where his father was teaching English, Conel returned to the UK and was educated at Foyle College, Londonderry and then at Hardys School, Dorchester. From there he went to the Middlesex Hospital to read medicine where he qualified in 1948. 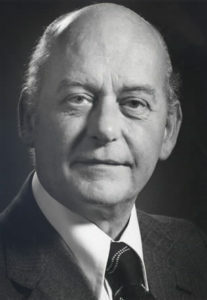 He obtained the MRCP in 1953 whilea Registrar at the Royal Free Hospital, was a Senior Medical Registrar in Sheffield, and then became a Physician at the Leicester Hospitals in 1963. His particular interest was gastroenterology and he established the endoscopy clinics at the Royal Infirmary and General Hospital in Leicester. He was President of the Leicester Medical Society and the local BritishMedical Association and a member of the East Midlands Physicians Group. He became a Fellow of the Royal Society of Medicine in 1975. He contributed to various papers including ‘Serum Transaminase Estimat. in Investigation of Myocardial Infarction’. He died at the age of 69 of non-Hodgkinsons lymphoma, leaving his wife and 4 children.